Now that I meal plan every week, I find it almost hard to remember a time when I didn’t meal plan or to imagine how I ever went to the store without a list. Meal planning makes grocery shopping and cooking so much easier; I don’t think I could ever go back. Sure, I don’t always look forward to sitting down to meal plan when I’m especially busy–it does take a little time one night a week–but once my meal plan is done, I’m always glad I did it. Haven’t started meal planning yet? 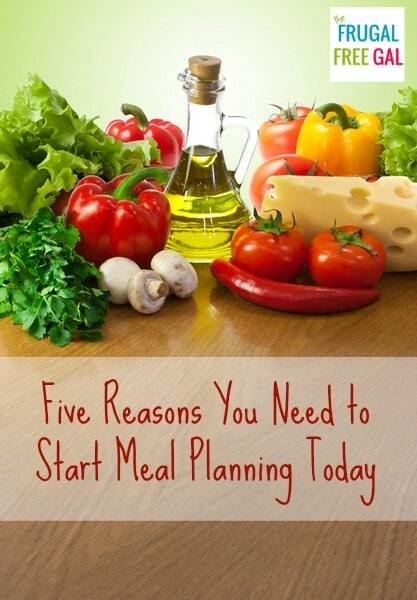 Here are five reasons YOU need to start meal planning this week. How much time do you spend each evening looking into the cabinets wondering what you are going to make? How much time do you actually spend making those “quick” trips to the store? Even if you only spend 15 min a night trying to figure out what to make, that’s an hour and 45 min a week. Add in three 30 min “quick” trips to the store, and that’s over three hours of your life wasted each week. By sitting down one night a week for 45 minutes to an hour to make a meal plan and a grocery list, you can easily save yourself a couple of hours every week. Plus, your shopping trips will go much quicker as well. One great thing about meal planning is that it allows you to make your list around the items that are on sale or that you have coupons for every week. Instead of just going to the store and picking up whatever looks good, you can intentionally fill your list with items that you can get for less. or example, if hamburger is on sale this week, then this week would be a great time to make more hamburger-based recipes. Not only will you make fewer impulse purchases when you shop with a plan, but you will be able to buy the things that you do need for less as well. Figuring out what to eat very night can be a real hassle. Plus, who wants to make extra trips to the store at 5 p.m. when you just got off work or when the little ones are clamoring for dinner? By planning your meals in advance, you can make sure you already have the ingredients on hand, you won’t have to make decisions every night, and you can even do some of the prep work ahead of time. Get dinner on the table and get on with your evening faster with a meal plan. What happens when you need to get dinner on the table in a hurry but you have nothing in your house that goes together to make a real meal? You hit the drive thru or order a pizza instead. While this is okay on occasion, many Americans have taken to eating convenience foods every night only is this very expensive, but it is very unhealthy too. Save your wallet and your waistline by meal planning instead. Another great perk of meal planning is that you can plan meals with similar ingredients for the same week so nothing gets wasted. Have a recipe that requires half a bag of spinach? Plan another spinach recipe the same week and put that spinach to good use! Stop throwing out all of those leftover ingredients. Make a meal plan, and you’ll reduce your waste and your grocery budget. Need a little bit of a meal planning boost? Try eMeals Meal Planning . eMeals offers a variety of plans including low fat, low carb, portion control, gluten free, clean eating, paleo, vegetarian, natural & organic, and classic plans. You pick your plan, get great recipes, shop and save, and cook and enjoy! eMeals helps to take the “guessing” work away so you can start planning great meals for your family. Do you meal plan? If not, what’s stopping you?